Samsung is going to unveil the new flagship Note series device Galaxy Note 8 on August 23 in New York and we have already seen that the device have already got the FCC approval in the US hinting towards the US availability with the launch on August 23 and was also spotted in some other leaks as well. Recently, we told you about the live support pages for the Galaxy Note 8 carrying the model number SM-N950F/DS on the Caribbean and Singapore websites of Samsung. 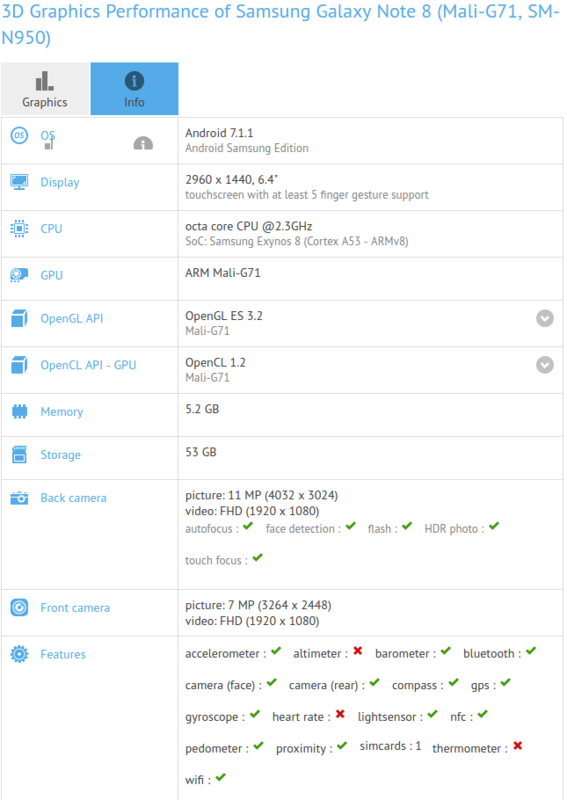 Samsung Galaxy Note 8 is now spotted listed by GFXBench benchmark website that have listed almost all it's specifications. The device is listed with the model number SM-N950 and is listed with Samsung Exynos 8 processor but its listed with ARM Mali-G71 GPU that confirms that it will be the Exynos 8895 processor. The GFXBench listing confirms a 6.4-inches QHD+ Super AMOLED Infinity display with 2960 x 1440 pixels resolution and is powered by the octa-core 2.3GHz Exynos 8895 processor with ARM Mali-G71 GPU. It comes with 6GB of RAM and 64GB of inbuilt storage capacity and some variants of the device will even support MicroSD card expandable storage as well with Hybrid SIM slot like the Asian variants usually comes with. It runs on the Android 7.1.1 Nougat OS out of the box but we may also see the device launching with the Android O 8.0 OS out of the box as the Android O is due to launch on August 21st, just two days before the Galaxy Note 8 launch. It is listed with a 12-megapixel camera but we can expect a dual rear camera with two 12-megapixel sensors with both supporting Optical Image Stabilization. It comes with an 8-megapixel front facing camera as well. It comes with standard connectivity options that includes 4G LTE, 3G, WiFi, Bluetooth and others. No other details about the device are available in the GFXbench listing. However, according to the rumors, it will have a fingerprint scanner on the rear panel near the dual camera module and will have a 4000mAh battery and will support wired and wireless charging as well. The latest rumors claims that the device will have a a dual rear camera with a 12-megapixel sensor having dual-pixel autofocus and a secondary 13-megapixel telephoto camera which will have 2x fixed optical zoom and both dual cameras will have optical image stabilization feature. It will feature an 8-megapixel front facing camera with an f1.7 aperture. 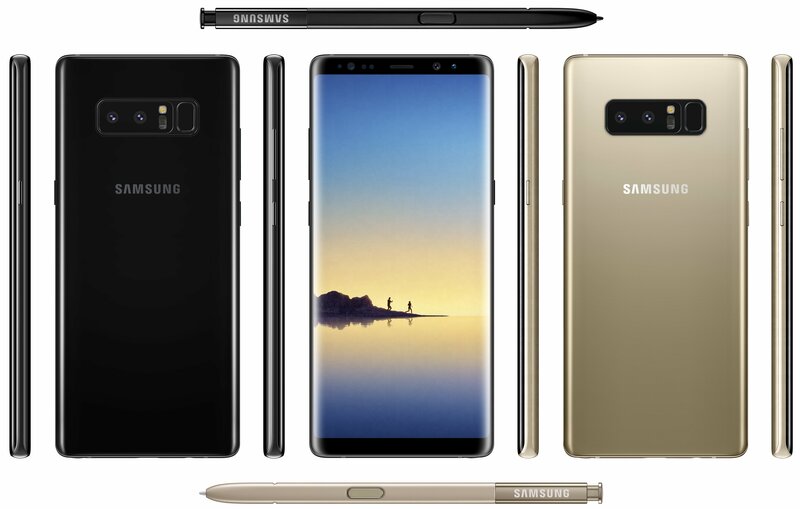 It will have dual speakers with an improved S-Pen and is expected to be available with black, blue, and gold color options. Its price is expected to be around €999 but we have to wait for the official event to confirm the same. The Samsung Galaxy Unpacked event will start on August 23, 2017, at Park Avenue Armory in New York City with doors opening at 10 a.m. (EST) and the official event will start at 11 a.m. (EST). Stay tuned.